The HyperX Alloy FPS Pro tows the line for minimalism, offering up an ultra-compact mechanical that takes up comparatively little desk space. However, outside of that refinement, this is just another HyperX keyboard. There are plenty who would just as much pay less for a keyboard that keeps things simple and plays it straight. Not anyone needs a keyboard with USB-passthrough, customizable per-key RGB and all the other bells & whistles. In fact, in today’s gaming landscape of esports athletes and streamers, an ultra-compact, feature-light keyboard makes a lot of sense. It’s easier to bring along to tournaments and makes for an all-around smaller physical footprint. The HyperX Alloy FPS Pro follows that niche to its natural conclusion. It’s the smallest - and cheapest - keyboard that HyperX have on their roster. However, it’s very clear from the moment you lay your hands on it that little to no compromises to performance or build quality have been made here. 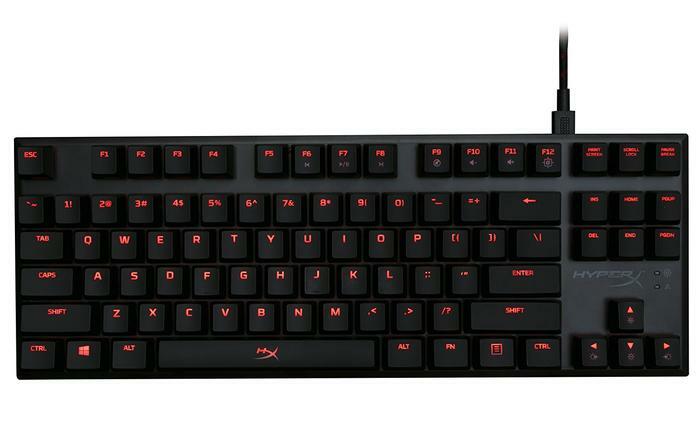 The HyperX Alloy FPS Pro is a mechanical gaming keyboard with red-LED underlighting, a solid-steel frame, Cherry MX keyswitches (your choice of either brown, blue or red), a detachable Mini-USB cable, game mode, 100-per cent anti-ghosting and N-key rollover functions. The new HyperX Alloy FPS Pro mechanical keyboard isn’t quite a revolution for the Kingston-owned eSports brand. Strictly speaking, it’s a refinement as straightforward as these come. It looks - and feels - like the vendor have simply lopped off the numberpad from their existing Alloy FPS keyboard. The display lights that used to be nestled in the top-right corner of the Alloy FPS have also been relocated. Apart from these changes, it’s the same old song and dance. Not that this necessarily a bad thing. What you’re left with is a gaming keyboard as compact as they come, but also still bearing all the hallmarks and high level of build quality you’d expect out of HyperX. 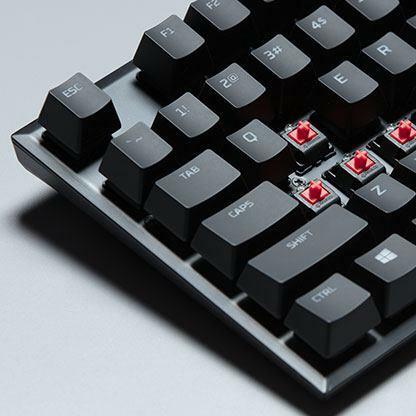 The steel frame design is a solid as ever, the red backlighting on the keys is easy to toggle or disable at your leisure, and the detachable cable makes wiring easier in a pinch. All things considered, the Alloy FPS Pro is more defined by what it doesn’t have than what it does.For better or worse, this is a product that’s exactly what it appears to be. There are no real surprises - but it does what it says on the box very well. That said, not all the cuts are welcome ones. I did miss the carry case that HyperX usually bundled in with their keyboards (and some of their headsets). In action, the FPS Alloy FPS Pro lives up to the same high standard set by the rest of the HyperX stable. Again, there are few surprises to be found here. As you’d expect, the Cherry MX switches work like a charm to provide tactile typing experiences and responsive gaming ones. These strengths are compounded by the usual HyperX pedigree for durability. The company say the key-switches on the Pro should hold up for a cool fifty million clicks. In addition, like their other keyboards, the company have thrown in a few extra-tough keycaps for the keys you’ll likely end up using the most. HyperX have kept things similarly straightforward when it comes to the Red underlighting on the Pro. Like the regular Alloy FPS, there are six preset LED modes available. Toggling these is all handled using keys on the keyboard - which saves you the trouble of installing any sort of software.You can modify the overall brightness of the effect to suit the environment and lighting of the room you’re using it in - but not much beyond that. Red is the only color available, so if you’re looking to set up anything more dynamic or complex - the Pro is probably not going to cut it. The HyperX Alloy FPS Pro is a product that’s kind of exactly what it appears to be. It tows the line for minimalism, offering up an ultra-compact mechanical that takes up comparatively little desk space. However, outside of that refinement, this is just another HyperX keyboard. There’s nothing wrong with that. Up until now, HyperX have made generally really good-quality gaming accessories, and the Pro does tailor the brand’s pitch to an audience they weren’t necessarily reaching before now. Still, as someone who likes and uses their products, it would be nice to see HyperX dabble a little less subtraction and a little more in innovation going forward.